There are many players and coaches who strive for good and straight-to-the-point information. Now that I’ve been playing tennis for over 28 years and taught this wonderful sport, full time, for almost 13 years, it would a great pleasure of mine to share my knowledge. Below you’ll find the answers that people wrote in response to the question that was presented (above) to them. I’ve tried my best to give them my honest answers hoping to clarify the issues and giving solutions to improving their tennis. I’d have to mention that some of the answers I provided below are already presented in great detail on my website (WebTennis24.com). Some issues are going to be the material for future articles / videos, and the ones I could give my straight opinion are there to be read and debated (which I strongly advise you to do whether you agree with me or not). – Some of the tips to answer your concern can be found here (check no. 13). In regard to missing shots that you’ve practiced a lot outside of competition… it will happen. And that’s because playing under pressure is obviously different: we tend to get impatient trying to finish the point, our movements are more tense and our eyes tend to stay on too many targets under pressure (ball, where the opponent is, court openings, net etc.). One tip I could give you in playing more relaxed and with confidence is to stop worrying too much about the outcome of the match. For many years, I played tournaments where after I won matches I went home disappointed for the poor performance despite the win. I found the solution to that when I stopped carrying about losing and focused on enjoying playing, going for my shots (regardless of getting them in or out) and overall building good relationships through tennis. One of the interesting things you will notice a top pro player doing is playing his best when he’s under pressure. It shows us that one should not let panic take over the game. If we go out losing we should go out fighting. – We have provided a lot of great drills for speed, coordination and conditioning at WebTennis24 (click here for direct link to respective drills) and WebTennisDrills (click here for direct link to respective drills). Enjoy getting fit! – My suggestion is for you to consciously practice (not during a match) the following: as soon as you recognize the ball coming to a certain side (e.g. forehand) turn the shoulders and get the racquet set behind the ball before it bounces on your side of the court. Consistent practice creates habits. Do it often in practice and it will become automatic in the match. – We have recently posted (what we consider) an excellent Serve tennis lesson showing the main technical steps of this important stroke (check out “Tennis Lesson: Flat Serve”) at WebTennis24.com. In regard to swing cycle and rhythm I would also recommend “Flat Serve: Progression Drills” particularly the “4 Steps (Shadow Drills)” and “Landing and Split Step” where you’ll find two drills to improve the Serve rhythm through shadow swings. – Use a combination of cross-over (first) and side shuffle steps. Best would be to learn through watching videos then put it in practice through drills. A good video in this regard to use as reference is “Recovery Steps after a Wide Ball” where you’ll see how to combine the cross-over with the side shuffle to move laterally to the ball and back to cover the court. – This can be shown through videos which I strongly recommend you take a look at our recent “Tennis Lesson: One-Handed Backhand Ground-Stroke” and “One-Handed Backhand: Progression Drills“. You’ll find all the main elements to hit a technically sound and consistent one-handed backhand. 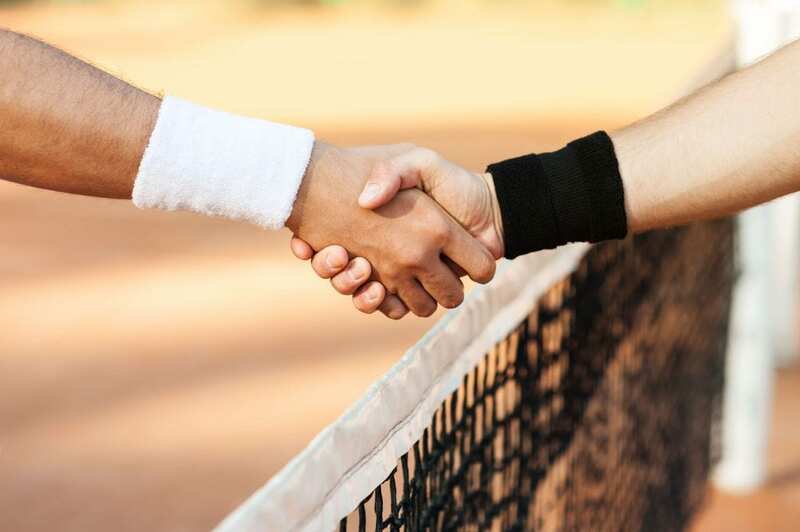 – The Anticipation in tennis comes with experience and a conscientious effort to pay attention to your opponent’s body language before he/she strikes the ball, as well as with a good court coverage knowledge. Study those and you’ll find yourself being in the right spot (most of the time), saving energy and winning points easier. Before I have a tough tennis match, I do this exercise (you can call it meditation, if you want)… I sit in a chair, comfortably, and look for a spot (no bigger than a button) that is at least 3 feet away. It can be any spot on the wall or… anything. Then I keep my eyes on it without straining my eyes. I stay still and focus on that spot for at least 1 minute. That has helped me clear my mind and learn to avoid shifting my eyes away from the object (in this case, the ball) which interests me. Also, in practice, saying to yourself “bounce (when the ball is about to land on your side) – hit (just before contact)” could help you stay focused on the ball too. – I once had a student who was 81. I loved him as a friend first and as the way he committed to improving his tennis. I would say you should get better with the choice of shots and understand and use the court geometry to your advantage. Depending of whether you enjoy singles or doubles, there are certain tactics and shot selections you could use in order to run less and cover the court more efficiently. I’ve spent a great amount of time presenting all the advantages that involve good knowledge of court coverage and how use them to save energy by positioning in the right spot when playing certain shots. Get an in-depth analysis of court coverage by clicking here. – Please see no. 58 (above). – The pieces of advise I gave to no. 51 (above) might help in teaching your daughter how to play tennis in a more relaxed state of mind. Best of luck! – This spring I’ll demonstrate (through videos) the footwork that applies to different strokes. But until them check out the advice I gave to no. 55 (above). – I find that keeping track of the score and visualizing myself winning the next point really helps in staying focused in the present and be positive during the match. Try it and see if it helps. – Please see the advise I gave at no. 51 (above). In regard to footwork, do at least two times per week drills specific to increasing speed and conditioning which you can find plenty at “Footwork and Fitness Tennis Drills” at WebTennisDrills.com. – Funny that you asked! 🙂 I just answered a similar question (see above – no. 66). – The racquet drop on the Serve is the result of uncoiling your body and pushing up from the legs in order to meet the ball. Keep your arm and wrist relaxed for a fluent motion. 7) practice the strokes you don’t feel consistent with; use drills that put you under pressure situations as the ones highlighted in the “Mental Strength Tennis Drills” section. – This is a good idea for future videos. Thank you for suggesting it! 71. “My game is fine but I’d like to know how to teach young children in a group ages 5 to 10 in a more effective way without them getting bored and waiting to hit balls. Sometimes I have to work with 8-10 kids on one court and I find myself stressed out trying to make the lesson fun and educational. It’s hard because most of them are beginners and since there is so many kids on the court it’s difficult to really teach the proper technique to each and spend the proper amount of time with them without neglecting the other kids. I just started teaching about 6 months ago and I work for an organization that places 8 to 10 kids on the court for each lesson. Sometimes 12 kids. – I feel your “pain”… At the beginning of my career I found myself working for a private school in Southern California where they would bring us (me and another fellow tennis coach) 15 kids with no court – we literally had to stretch a tennis net on a synthetic grass space and teach them tennis. We did the best we could but I recall that period of time being a stressful one. I congratulate you for your commitment to give value to those kids even though it is not an easy task. So here are my pieces of advise which I do hope to help you. By the way, feel free to get in touch with me via email or contact forms on the WebTennis24.com or WebTennisDrills.com sites to let me know how much more I could assist you. 4) don’t spend too much time with one drill or game; have at least 10 different drills or games ready for one hour lesson. 5) to teach them proper technique when they are in large groups use games like “Jail Breaker” (which you can find at WebTennisDrills.com) – that keeps kids having fun while you enforce the correct technique. 6) overall, keep it fun! – The key elements to a good return of serve are: reading your opponent’s body language (predicting the type of spin and placement), footwork and preparation. 2) Return of Serve Tactics – an excellent resource presenting how, where and why you should hit your return of serve according to certain tactical situations. – First thing I would like to tell you is to improve your technique by shortening the back-swing (not taking the racquet too far back when setting up for the shot). This will allow you to prepare earlier and make contact further out in front for more ball control. Second… stay low. This will allow for better balance and body control. And last, do not try to match your opponent’s power. Play at the pace you feel comfortable and be consistent with your shots. – Besides the advice of keeping the eyes focused on the ball and let your peripheral vision take care of placement of the ball please see the answer to no. 58 (above). Have fun!